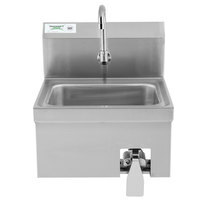 Hand washing is a crucial part of every food service operation, so commercial hand sinks and accessories are an indispensable tool in your kitchen. 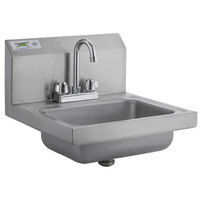 We carry a large selection of hand sinks in a variety of sizes and styles so all your employees stay as clean and sanitary as possible. 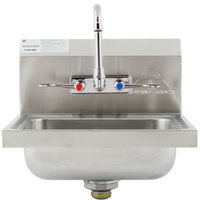 They will help stop the spread of communicable diseases and airborne illnesses. 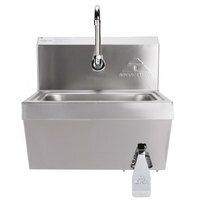 A hygienic working environment is not only preferable, but it's also essential to running a successful restaurant, cafe, healthcare facility, or anywhere else food is made. 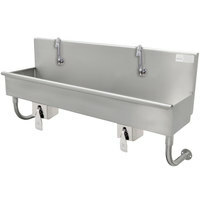 Our commercial hand sinks are made to fit in several different locations in your facility. 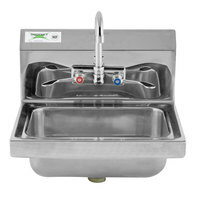 We offer hands-free automatic commercial hand wash sinks to efficiently prevent cross-contamination in your kitchen. 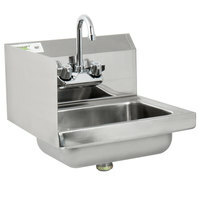 Need a model that includes a hand soap dispenser and towels? 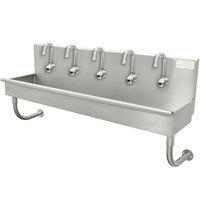 We have a number of sinks with these features. 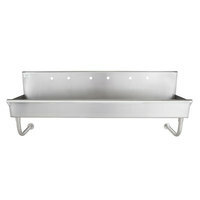 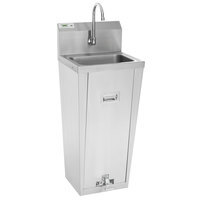 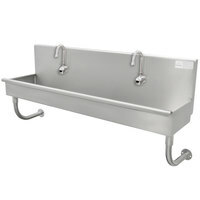 We even have mobile hand sink carts that are perfect for outdoor banquets, carnivals, weddings, and produce stands. 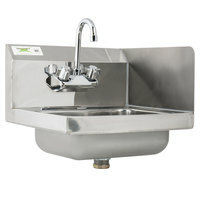 Good - Efficiently wash and sanitize your hands with this Regency 17" x 15" wall mounted hand sink with gooseneck faucet. 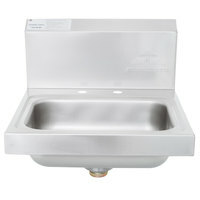 This easy-to-clean, compact sink fits in tight spaces to open up floor space for other uses. 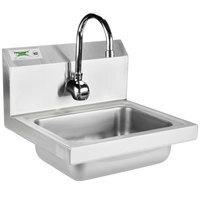 The hand sink is also made from stainless steel, ensuring reliability and durability. 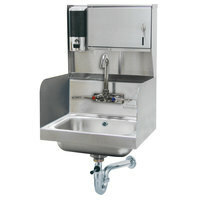 With built-in bolts and an included wall-mount bracket, this Regency hand sink unit will be easy to assemble in any restaurant, bar, or cafe. 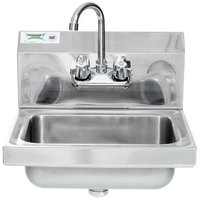 Advance Tabco 7-PS-60 Hand Sink with Splash Mount Faucet - 17 1/4" x 15 1/4"
Best - The Advance Tabco 7-PS-60 hand sink is the perfect choice for fast pace environments including restaurants, bars, and auto shops for its durability. 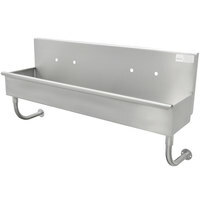 This American-made sink is constructed of high-quality 304 stainless steel, ensuring reliability for long-lasting use when properly maintained. 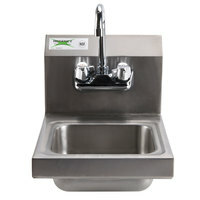 The non-drip, countertop edge helps prevent water spilling over, keeping your kitchen clean and safe. 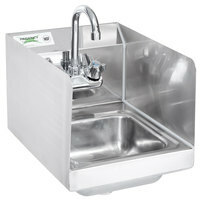 Rated Best in Class, this easy-to-clean sinks easily fits in tight spaces to open up floor space for other uses. 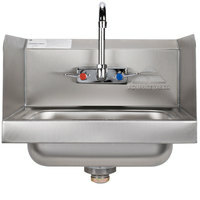 Advance Tabco 7-PS-66 Hand Sink with Splash Mounted Gooseneck Faucet and Side Splash Guards - 17 1/4"
Best – Rated Best in Class by foodservice operators and dealers, the Advance Tabco 7-PS-60 hand sink is the perfect choice for fast paced environments including restaurants, bars, and auto shops. 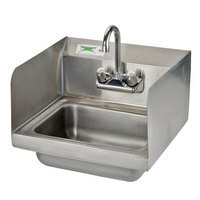 This durable American-made sink is constructed of high-quality 304 stainless steel, ensuring reliability for long-lasting use when properly maintained. 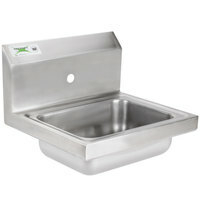 The non-drip, countertop edge helps prevent water spilling over, keeping your kitchen clean and safe. 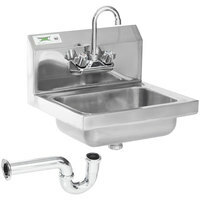 Advance Tabco FC-WM-40EFADA 16-Gauge ADA Multi-Station Hand Sink with 6" Deep Bowl and 2 Electronic Faucets - 40" x 19 3/4"
This Advance Tabco FC-WM-40-EFADA 16-gauge multi-station hand sink with 6" deep bowl and 2 electronic faucets is a dependable solution for your hand washing needs. 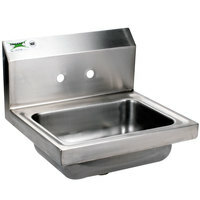 Its 16-gauge construction offers good durability for most applications. 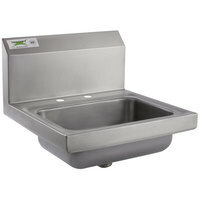 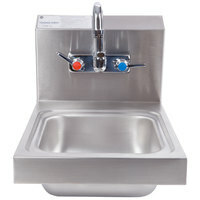 Advance Tabco FS-WM-40-EFADA 14-Gauge Multi-Station Hand Sink with 5" Deep Bowl and 2 Electronic Faucets - 40" x 19 1/2"
Perfect for restaurant kitchens, grocery stores, and industrial settings, this Advance Tabco FS-WM-40-EFADA 14-gauge multi-station hand sink with 6" deep bowl and 2 electronic faucets maximizes your space while offering a sink solution that meets your needs. 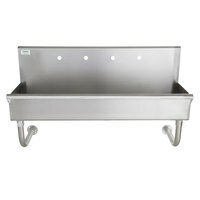 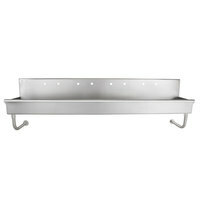 The 14-gauge stainless steel construction is sturdy enough to withstand even the busiest commercial use.